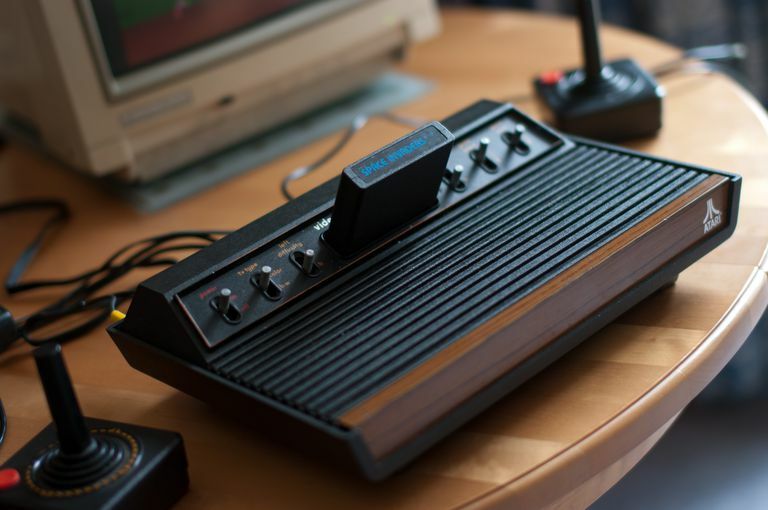 After conquering homes and arcades with Pong in the early 70s, Atari sought out to reinvent the home gaming market with a console unit capable of a constantly growing library of interchangeable games. This would eventually evolve into the Atari 2600, a system that dominated video gaming and broke records over its 13-year history. The rise of the 2600 made it into the longest running console model in history, but not without some collateral damage. With success came the dethroning of Atari's founder, and the eventual video game industry crash of '83. TV/Video Game Switch Box with VHF Y-connectors and cord. The 2600 had wood printed panels, designed to look like a piece of furniture over a console or computer. Although it went through a few revisions, the main unit was always rectangular with cartridge slot and option switches at the top-back of the unit; controller ports were in the back, as was the TV/video cable plug. The first manufactured version featured six option switches at the top of the unit. Game Select: Used to flip through various game modes when available. The controller ports design became a standard input device for many other systems, including the ​Commodore 64. In addition to the joysticks and paddle controllers that came with the unit, these inputs could also be used to connect various peripherals. In the first remodel of the unit, the Difficulty Setting switches were moved to the back panel. Only four remained at the top, with two different unit shells available; one all-black and another with wood paneling along the front. The most dramatic remodel of the 2600 was the budget version released in 1986. The size was reduced dramatically, with pointy corners, an upward angled top panel and all-black with a silver stripe across it to look more modern. The switches were now squared plastic sliders. The original core system came with two joystick controllers; each self-contained controller featured a squared base housing a motion stick and single orange button. The two paddle controllers were connected in a single cord and plugged into just one controller port. Paddles could be turned clockwise and counter-clockwise with an orange action button on the left side panel. These controllers were used mostly for Pong and Breakout style games. The 2600 released in 1977 along with nine different game cartridges, one packaged with the system (Combat).